Pores, the bane of many a girls life.. but fear not, there’s a whole raft of pore-vanishing primers out there to help combat those pesky little skin-craters. Of course the catch being that they don’t actually make the pores go anywhere, just creates a smoother looks for the skin, so then when you apply foundation it glides over them rather than settling into the pores and emphasising them. The way in which primers do this is with a silicone based concoction as silicone is the perfect ingredient to create that smoothed and flawless finish. But, it’s not all hunky-dory in primer-land – some people really don’t get along with silicone based products – with some of them causing reactions in sensitive skin, or others finding that they can cause break outs by blocking the pores. But for those that are ok with the idea of a slick of silicone creating a flawless look and reducing the appearance of pores… I have two primers for you, a Maybelline one on the bargainous ‘save’ side, and a Benefit one on the splurgy ‘spend’ end of the scale. The latest addition to the Maybelline ‘Baby’ range this little tube (and the tube is quite dinky) is the sort of product that Instagram goes mad for. It’s turquoise and it’s got cute writing on it. What more does a product need?! But pretty packaging aside, what is this like? Well this feels very much like a straight-up silicone primer, and it basically is – it’s a clear, thick liquid that smooths on to skin and basically vanishes. It does leave skin feeling really smooth, with that slightly ‘slippery’ feel that silicone leaves behind (like freshly polished wood table or something – slippery, not greasy or oily). Does it erase pores? Well no, not really when used on it’s own – but as a base for foundation, it does really help smooth them over to avoid foundation settling into them at all. Of course primers are designed to be used like this – before foundation – but I mention the effect it has on it’s own as it’s worth noting in the comparison with the Benefit Porefessional. So on the spend side, we have Benefit. The brand behind some of the cutest and quirkiest products out there. 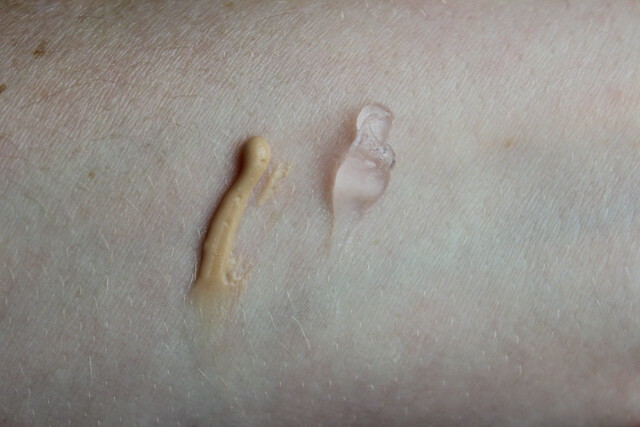 This primer, or ‘pro-balm’ as they like to call it does have a slightly different look to it – as rather than translucent it’s a lightly tinted product as you can see in the pictures. 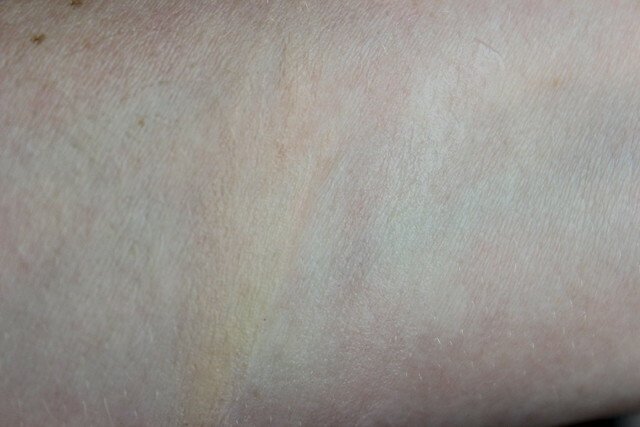 On the final image, where I have just lightly blended both products out you can see how the Benefit does offer a subtle tint to the skin – where the Maybelline one just vanishes. This is what sets the product apart – the slight tint and the texture combined create an instantly perfected finish – not flawless immediately, but instantly improved. It’s one that can be used as a smoothing base, or just on it’s own. Interestingly, the two products contain a lot of the same ingredients (dimethicone, dimethicone crosspolymer and silica are all listed as some of the top ingredients for them both) which is often the sign of a good dupe. Of course, they’re not identical but the textures are comparable. So if you’re on a budget you have a great alternative option out there. Personally though, for the fact that the Benefit one has an instant erasing effect – on it’s own, rather than just when under another base – this would be my pick. There have been days when I’ve been feeling lazy and I’ve opted to just smooth this over my t-zone area to even things out quickly and easily. For that reason, I would say in this instance the Benefit is worth the splurge if you can. If not though, never fear – combined with foundation you have a good bargain option with the Maybelline. Previous Post Goodbye 2013…hello 2014! I have been waiting for a comparison posts on these! I cannot wait to try the baby skin! I, myself, am a lover of Benefit’s professional but after reading this I definitely want to try out the Maybelline one to see how it competes. Am I tripping or does the Maybelline one seem to give off a bit of color? I tried a No 7 primer before and it broke me out terribly so I have stayed away from primers since then. 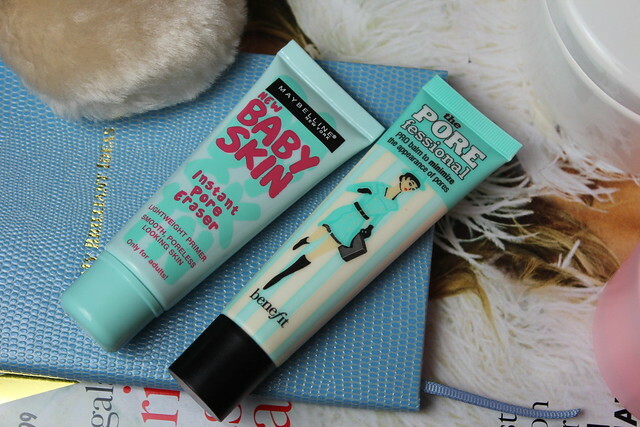 Very interesting, I was wondering about the baby skin as I’ve tried benefit’s before and just thought it was Ok.
There’s been so many reviews of the Maybelline (including my own), it’s so nice to see the two often-compared products side-by-side! I’m actually kind of surprised that the Maybelline version works so well–sometimes drugstore offerings of such products just don’t compare to high end. Thanks for your reviews! This is a handy review, as I was just wondering about the Maybelline Baby Pore Eraser. I have a small tube of Porefessional which I like, but I also have W7 Prime Magic Camera Face Primer and that looks a lot like the Maybelline one, and I think that works pretty well too :). I have so many primers, I’m not that keen on trying this really, thanks for the review! I’m almost finished my mini sample size Porefessional and need to decide which of these to invest in next. Decisions decisions! I have been reading so many positive reviews about the Maybelline Baby Skin, that I can’t wait to buy it!